Galaxy radios. Galaxy 10 meter radios. Excellent service, low prices, repair, warranty, tuning and fast world wide shipping on the latest Galaxy radios. **New November 2016. Galaxy Dx55F, Galaxy Dx66v2, Galaxy Dx86v SSB. *New July 2013 Galaxy DX99V2, New in 2012-2013 Galaxy Dx 47HP. New in 2010-2011 Galaxy Dx33HP2 and Galaxy Dx29HP. Many older Galaxy radio models have been discontinued and are being replaced by newer models with even better features. Galaxy radios now have a 3 year manufactures warranty. All of our 10 meter radios come with a factory microphone, power cord, mounting bracket and mounting hardware. This section is for Galaxy 10 meter radios. 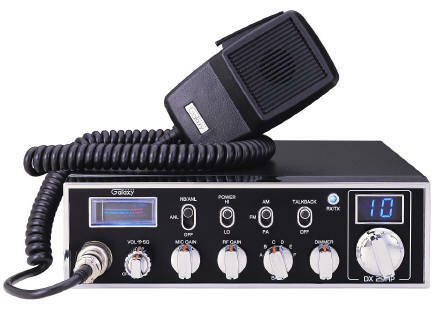 For Galaxy Cb radios see Cb radio in the left menu. Don't forget to add our $35 tuning. We also offer a $45 modulation upgrade on select models which includes the tuning. For the extra $10 this will make the radio output much louder and "beefier". If anyone other than GI Joe's tunes or works on your Galaxy radio that does void your warranty with us. Tuning includes aligning the receive, transmit, meters, any other necessary adjustments and a visual inspection of the radio. If you do encounter a problem you should contact GI Joe's first for help or instructions. On the Galaxy radio "View Detail" pages you will find more information and tuning selections. Also there are options to make the Galaxy radio a base by adding a 120Vac to 12Vdc power supply. The smallest power supply listed is the smallest one that will run the radio. You will only need one of the larger power supplies if you plan to run more equipment with higher current (Apmerage) demands. As there are not a lot of base radios on the market the mobile with external power supply option gives you more for your money (as compared to a base radio) and a better selection of radio features to fit your needs. The new Galaxy Dx-55F is a simplified version of the Dx55v in a "Cobra 29/Galaxy Dx929" size chassis. The galaxy Dx55F also features a front 4 pin mic jack, AM, Backlit Starlite faceplate. It has the same power as previous Galaxy High Power(HP) models. *No Echo, no PA, no FM, no Roger Beep. 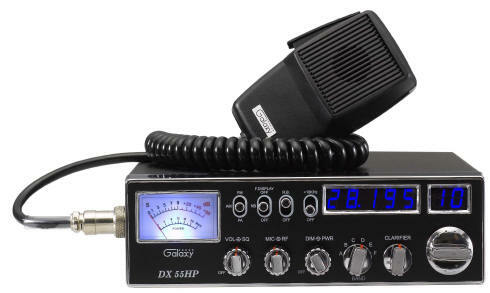 The new Galaxy Dx-66v2 is a simplified version of the Dx66v in a "Cobra 29/Galaxy Dx929" size chassis. The galaxy Dx66v2 also features a front 4 pin mic jack, AM, Backlit Starlite faceplate, dual control echo with talk-back on/off switch. It has the same power as previous Galaxy High Power(HP) models. No +10KHz switch, no FM, no Roger Beep, no clarifier. The new Galaxy Dx-86v is a simplified version of the Dx99v2 in a "Cobra 29/Galaxy Dx929" size chassis. 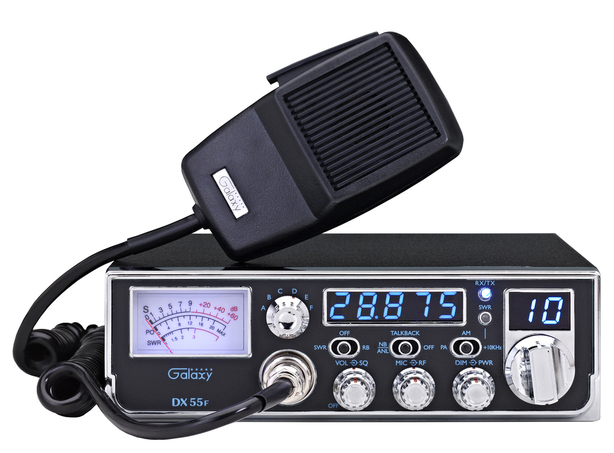 The galaxy Dx86v also features a front 4 pin mic jack, AM/SSB, Backlit Starlite faceplate. It has the same power as previous Galaxy High Power(HP) models. *No Echo, no +10KHz switch, no PA, no FM, no Roger Beep. Note: The Clarifier will work as a 10KHz switch. **NEW JULY 2013** The Galaxy Dx99v is back with a few upgraded features in the new Galaxy Dx-99v2. 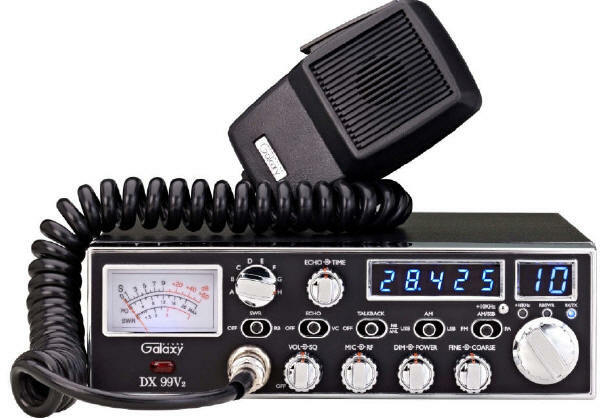 The new Galaxy DX99V2 is the only Galaxy all mode mobile radio. The Dx 99 V 2 operates on AM/FM/LSB/USB. 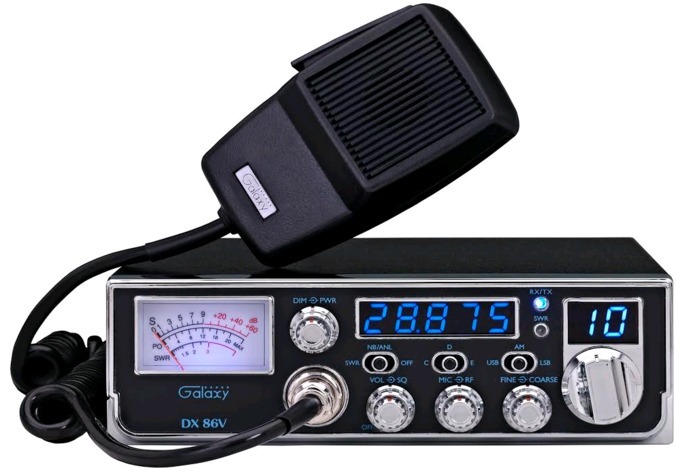 With dual MOSFET finals (instead of four or eight finals) the Galaxy DX 99 V2 draws less than 10 amps and can be hooked up anywhere a standard radio is wired – no special heavy gauge wiring is required. The front mic jack allows this radio to fit into tighter spaces than the original version. New in 2012-13 Galaxy Dx47HP 10 meter radio. All the best features in one low cost radio. Some features in the Galaxy Dx 47 HP are a large galaxy meter, backlit with 7 selectable colors, SWR meter, Blue LED's, echo and 100w+ output after tuning. New in 2012 Galaxy Dx44HP 10 meter radio. All the best features in one low cost radio. Some new features in the Galaxy Dx 44 HP are a large galaxy meter, SWR meter, Blue LED's, echo and 40w+ output after tuning. **New Oct 2010. Excellent service, lowest prices on Galaxy Dx29HP 10 meter radios. High power, talk back. Tuning, modulation upgrade and echo install available for Galaxy Dx 29 HP. Introducing the new Galaxy Dx33HP2 radio. It is basically the same as the regular Dx33HP Galaxy radio with blue LED's and dual MOSFET finals. New front mic jack and rear frequency counter jack. New Galaxy Dx33 HP 2 10 meter radio. The new Galaxy Dx94HP 10 meter radio has a small heat sink on the bottom. It is the radio that is replacing the Dx99V. 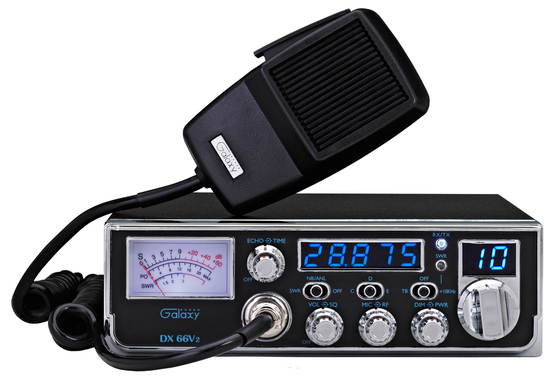 The Dx94 Galaxy radio has Dx94HP AM SSB Galaxy radios, blue LED's, echo, talk-back, frequency counter and 4 MOSFET finals for 100+ watts of power after tuning. 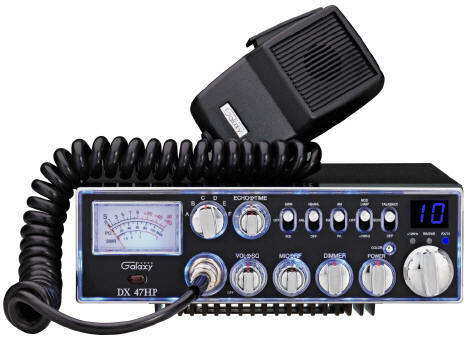 Galaxy Dx 94 HP 10 meter radio. 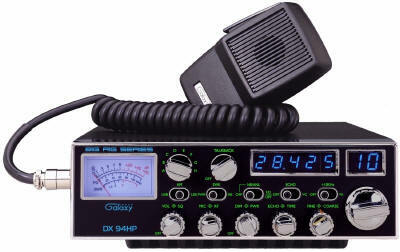 Galaxy 10 Meter radio Dx98VHP. The Dx98 VHP has 8 MOSFET finals for 30% more power and Blue LED's with "Star Light" backlit faceplate. The New Galaxy Dx98VHP radios have dual echo control, voice changer, variable talk back, variable power and side mic jack. 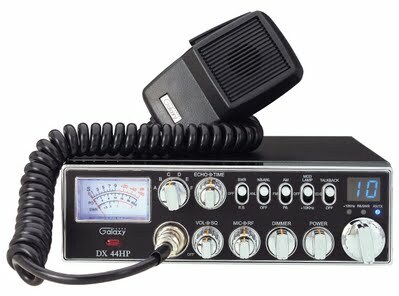 The new Dx55HP Galaxy radio has a few new features as compared to the discontinued Galaxy Dx55. 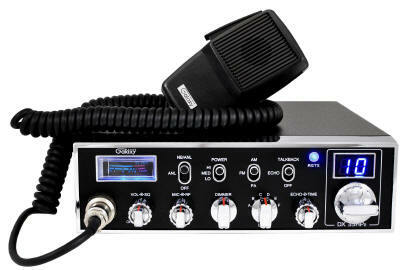 The new Dx55HP Galaxy 10 meter radio has blue channel LED's and meter light and dual MOSFET finals for about 40 watts. *This model does not come with echo or talkback. There is an option to add them on the view detail page.